People die of tuberculosis because we lack the global political will to fight it. This pair of lungs is infected with tuberculosis, which is now one of the top ten causes of death globally. Tuberculosis, a curable airborne disease, is back on the list of the top 10 causes of death globally, the World Health Organization announced Thursday. TB is now the fifth most common cause of death, following heart disease, stroke, lower respiratory infections and chronic obstructive pulmonary disease. It killed 1.8 million people in 2015, according to the WHO’s latest Global Tuberculosis Report. 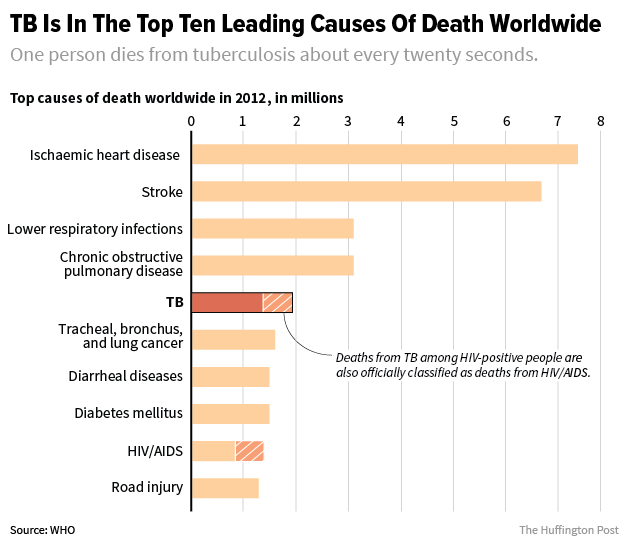 For the second year in a row, TB was the world’s top killer among infectious diseases, surpassing HIV/AIDS. Last year, 1.1 million people died from HIV/AIDS ― and 400,000 of those deaths involved coinfections of tuberculosis and HIV/AIDS. The high mortality numbers from TB are a major cause for concern, public health officials say. “As the leading infectious disease killer on the planet, as a killer that we have the ability to diagnose, treat and cure, we have every reason to want to shift our attention to focus on tuberculosis and aggressively challenge the global health community to prioritize TB,” said Eric Goosby, the United Nations special envoy on tuberculosis. 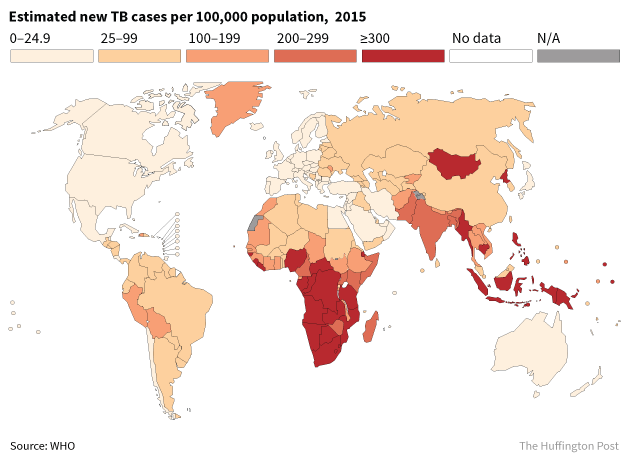 The number of new TB cases rose to an estimated 10.4 million in 2015, up from the original estimate of 9.6 million in 2014. Officials attributed the increase to better surveillance data, which more accurately capture the scope of the epidemic, particularly in India. “Whenever we start seriously looking to find TB, we find more of it than we thought was there,” said David Bryden, a tuberculosis advocacy officer for the nonprofit advocacy group Results. Experts stressed that the overall rate of new tuberculosis cases actually decreased 1.5 percent between 2014 and 2015, due to a revision upward of the original 2014 numbers. 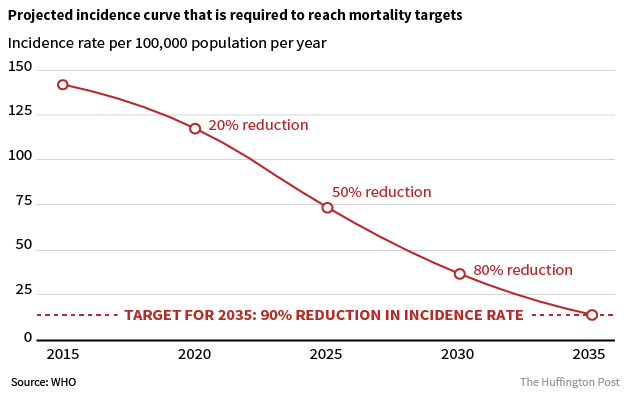 However, this rate of decline is far short of the 4-5 percent annual decrease in new tuberculosis cases needed to get to the 2020 milestones laid out in the WHO End TB Strategy. The Global Tuberculosis Report estimates there is a nearly $2 billion shortfall in needed investment to fight TB in low- and middle-income countries, and a $1.3 billion gap between current levels of research and development funding and what is needed to truly address the disease. It also suggests that a little more than 40 percent of new tuberculosis cases in 2015 were not captured by health care systems ― meaning these people are likely not receiving treatment. Many experts point to a lack of global political will needed to eliminate the epidemic of tuberculosis, even though that’s one of the U.N.’s Sustainable Development Goals for 2030.
International outcry is missing in the fight against tuberculosis, said Matt Oliver, head of the Secretariat for the Global TB Caucus, a worldwide group of parliamentarians. Dr. Lucicia Ditiu, executive director of the international Stop TB Partnership, is calling for a high-level U.N. meeting focused on tuberculosis to muster both the political will and the resources needed to fight the epidemic. Such meetings have previously been held to muster the support needed to battle HIV/AIDS and the rise of antibiotic microbial resistance. Tuberculosis is tied to both of those problems. As Ditiu pointed out, it’s a leading killer of HIV/AIDS patients, and due to the rise of multidrug-resistant strains of TB, it’s expected to account for up to a quarter of deaths due to antibiotic resistance by 2050. The WHO’s Raviglione also called for a high-level U.N. meeting specifically focused on tuberculosis. The United States needs to ensure that TB is treated as a priority on the next president’s health agenda, stressed Bryden of the nonprofit Results. The Obama administration unveiled an ambitious White House action plan last December to fight the deadlier multidrug-resistant strains of tuberculosis, otherwise known as MDR-TB. But then it proposed a budget cut to the U.S. Agency for International Development’s tuberculosis funding a few short months later. A mere 3 percent of U.S. global health resources go to tuberculosis, according to Bryden. Rep. Eliot Engel (D-N.Y.), who co-chairs the House TB Elimination Caucus, stressed that the dire statistics presented in this year’s Global Tuberculosis Report more than justified the call for more funding. “Without increased funding, we cannot hope to meet our shared goal of ending this disease,” he said in a statement to The Huffington Post. Cheri Vincent, the chief of USAID’s Infectious Diseases Division, highlighted the new level of coordination and innovation going into the MDR-TB action plan and promised a more thorough update next March, to coincide with World TB Day. While experts have applauded the work of various health agencies under the White House’s action plan, insufficient funding will likely undermine the plan’s ambitious goals to curtail MDR-TB around the globe ― even as the crisis grows. The WHO counted 100,000 rifampicin-resistant TB cases on top of the 480,000 MDR-TB cases in 2015. Rifampicin-resistant TB cases are treated with the same second-line drugs as MDR-TB cases, and thus many experts would say the MDR-TB numbers jumped to 580,000 last year. 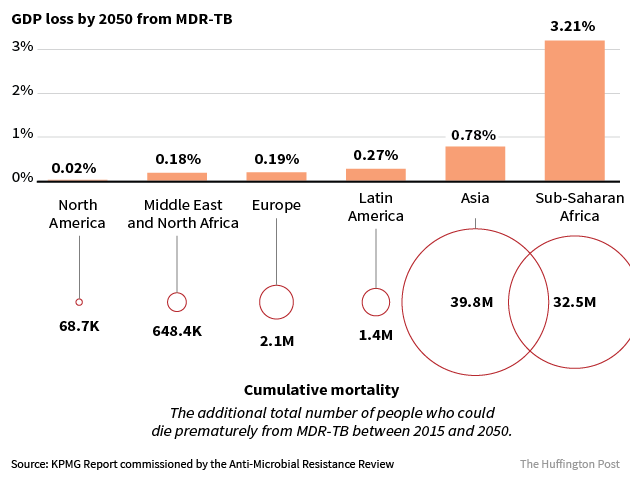 Multidrug-resistant tuberculosis alone is expected to cause more than 76 million deaths by 2050 and cost the world $16.7 trillion, according to a KPMG report commissioned by the Anti-Microbial Resistance Review. Alissa Scheller created the infographics for this report.